Arianna is 13 years old. She happened to have been born with one extra chromosome, a fact that is neither positive nor negative but certainly has been a challenge for her in many ways. As parents we learned that the medical term is designated Trisomy 21. We feel very strong about using that term. Verbalizing that our daughter had Down Syndrome made us feel that we were making a prophecy about her future that impeded her growing into the person she really was truly capable of becoming. Since day one Arianna has been given an empty book to write her own story (her own life). No prognosis, no predictions were made on her future. She has proved us right. Her potential keeps increasing. We are a family that found NACD just after our daughter was born. She started the NACD program when she was 11 months old and continues to do program every single day. Arianna started talking when she was 14 month old. The only difference with some other children is that within our family we speak three languages. So she absolutely had to speak, write and read in three languages: Catalan, Spanish and English. Fortunately she has never needed nor received speech therapy and functions quite well in the three different languages. We are originally from Spain. The education system is based on social integration so she has attended a regular school since she was 3 years old. She had support with specific areas but she never had a para-teacher assigned to her. She mainly stayed with her classmates and was pulled out of the class to work in small groups when she required assistance in specific areas. In addition to her class work she always worked with me (her mother) doing NACD’s program within the school premises. During many years it was about 1 hour a day in school, and we would work with her more intensely during the weekends. Two years ago we moved from Spain to the United States. For Arianna it was a stretch to go from a school where she had the same friends for many years that knew, loved and respected her to a new environment where everything was different. She was placed in a regular school. I worked with her every morning in the school for three hours to help her speed up her English and to administer NACD’s program. Last year she changed schools again because she was going to middle school. So many changes have made her stronger and more able to find solutions to the daily challenges of a social system which struggles to encompass children with diverse learning needs. Some of those solutions have taken her to the principal’s office, while others have led to her finding new friends – none of them come easily but she always seems to find them. I keep telling her that school may not teach her much but it gives her the opportunity to prepare for her for the “real” world where situations will appear and she will have to know what to do. So we look at the school as the place she can practice her future situations; and sometimes she is right and sometimes she is not and she has to live with the consequences. Our experience with the different school systems takes us to the same conclusion. No country, no school and almost no teacher seems to be prepared to have children that are outside of the norm. The school system thinks they are, because they just lower the expectation, make it easier, and let them “be.” “Let them be” means let them behave poorly and assign them a para-teacher that will do everything for them so they don’t have a chance to become more responsible. In all the schools Arianna has attended we (the parents) have ended up adapting the curriculum because the school doesn’t have one already made that will suit our daughter’s needs and, unfortunately, there appears to be no one trained to do so. Arianna has managed to navigate well through all her 13 years of life. 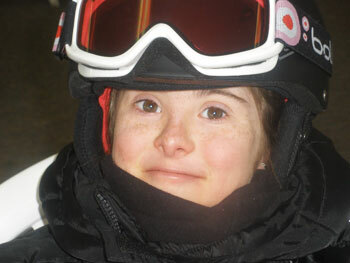 She faces program every day, or almost everyday, with a smile on her face. She believes she is very lucky because she has her mother to work with and her father to coach her in sports. Especially during the last two years Arianna keeps thanking us for what we do for her. She is very aware that program makes people clever. She is fiercely competitive when faced with a challenge. If she sees a child that is behaving strangely, she tells us that she thinks the child should do NACD. She also believes that she doesn’t have Trisomy 21 any more. She talks about the times in the past when she had Trisomy 21 and she feels proud of how she has worked to overcome many of the challenges that she faced. For her, it is something she believes she has overcome due to her effort and hard work. Arianna has many hobbies. She has played piano since she was 5 years old, sings in the school choir, dances ballet, plays tennis, skis and enjoys horseback riding. At home she likes to do a few chores (though not as many as her parents would like) that make her feel that she contributes to the family and she is helping us with our stressful lives. She loves her sister Natalia and competes with her in a sisterly way on the soccer field – sisterly but quite competitively. Emotionally she is very concerned about other people´s feelings. She reads our faces and if we look stressed she suggests that we should take a hug and do some breathing to feel better and relaxed. Arianna is working hard in order to have a mobile phone once she turns 14. The only rule is that she needs to behave maturely and make good decisions. That is a real good objective for her, she has a year ahead and she is trying hard. Future. We don’t know what the future holds for our daughter. We know it will not be easy, she faces challenges everyday, but we feel very confident that whatever she ends up doing it will be her choice, not the choice society would have made for her. Thanks NACD, thanks Sara, without you Arianna would not be where she is. I have had the wonderful opportunity to work with Arianna since she was an infant. It has been an amazing journey to visit with her parents through telephone and video, then Skype, while they lived in Spain. She was bilingual from an early age, as her father was American and her mom was from Spain. They created an environment rich in language from the start. They never signed with her, never looked at alternative methods for building language or anything else, other then what they did with NACD. In Spain they were required to start full day school at a very young age. Arianna did very well, and her mother continued to do program with her after school, as well as going into the school and working with her daily 1:1 program in a separate room for 1-2 hours. They moved to the states in the summer of 2010. It was quite an adjustment for all of them. Arianna could speak English, but she still had to adjust to thinking in the language, rather than her native languages of Catalan and Spanish. It was wonderful finally to meet and see them on a regular basis, rather than having to do all through Skype. I am so impressed with how well she has done. Imagine how hard it would be to adjust to a completely new culture, being fully immersed into a language that you knew but didn’t know well. Despite this huge transition, Arianna has managed to come through academically and socially. Since moving to the states, her reading ability in English has come up 2-3 years. Her math skills have increased more than 2 years. She continues to read Spanish, but her level of understanding English is significantly better. Her auditory sequential processing, which they have worked on since she was a baby, is now at a 7 forward and 4-5 reverse. 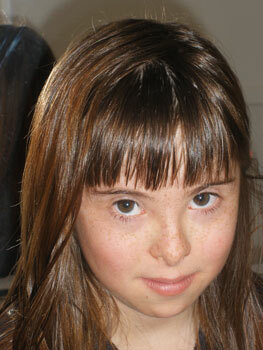 Arianna is very busy, not only with school, but with sports and piano, as well as playing with her sister Natalia. She is a vibrant healthy pre-teen with such a bright future. I must say that working with Marta, Arianna’s mom, and her father and sister, has been such a rewarding experience. Marta and David work very hard to help each of their children excel. They have kept their level of expectations high. Marta has gone back to school in order to get the qualifications necessary to take what she has learned from NACD and apply it to other children. Their dedication to Arianna motivates me to be a better parent, a better advocate for my children, and an advocate for those children who don’t have a Marta or a David or a Natalia.